120 x 300mg Veg. Caps. Barley Grass contains naturally occurring minerals, enzymes, vitamins and chlorophyll in a perfect 'nature-made' blend and is extremely alkalising for the body. 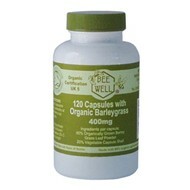 Due to its alkaline nature, Barley Grass is neutralising, balancing and nourishing for the body, making this your perfect choice for natural nutrition to help balance your system. Green barley leaves are extremely alkaline, so digesting them can help keep the bodies alkaline and acidity ratio balanced. Our cells cannot adequately function if the PH range (which measures acidity and alkaline) is not in a narrow range. Most processed foods are acidic, and when we consume too many of them the acidity-alkaline balance is upset. This may result in possible fatigue. Take 4-6 Vegetable Capsules a day.